Delight of the mod fans of the ABA . . . Likes animals so well that his last two pets have been a young lioness and an ocelot, which he could almost outrun . 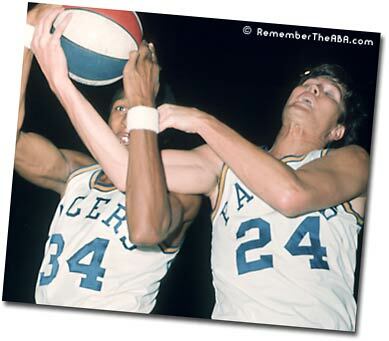 . . Smoothest shooting big man in the ABA . . . Quick release, excellent eye . . . Take-charge offensive player, stand-around-and-gape defensive player as often as not . . . Best move is juke toward baseline and cut for the foul line for a fine, floating jump shot . . . Unstoppable hook shot going to his right . 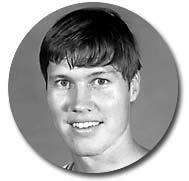 . . Looks like choirboy, but hits offensive boards like a demon . . . No. 2 draft pick of San Diego Rockets of NBA . 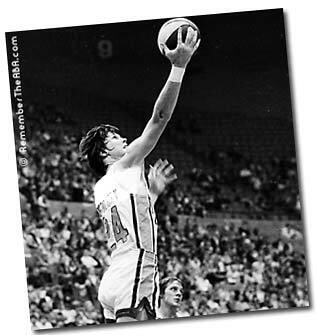 . . Only player to make ABA's All-Flake team four years running . . . "If you're single," he says, "and you don't wear a gray flannel suit, they say you're different. I wear mod clothes, enjoy good times, and I like to party. If that's a flake, then I'm a flake." . . . Owns bar called "Neto's' in Indianapolis . . . Close friend of Artie Heyman, that tells it all . . . One lady fan said of him: 'He's got the sexiest teeth in the ABA" (whatever that means). 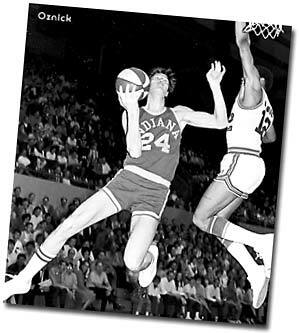 MEMORIES OF STEVE OOLEY: "There is one major Pacers player who should be mentioned in the top three or four players ever to wear the blue and gold. 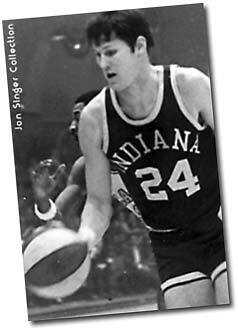 That player is #24 Bob Netolicky. Netolicky was one of the all time great Pacers and one of the most colorful characters in the ABA. It has been said that "Neto" was the "Broadway Joe Namath" of the ABA, only Neto won more championships! I remember going to a nightclub after every Pacer home game and partying until late in the evening with all of my favorite Pacers at "Neto's in the Meadows," a popular Pacer night spot owned by Mr. Netolicky. It was very interesting to see my heroes' fleet of cars in the parking lot of the lounge. Roger Brown's pink Cadillac El Dorado, Freddie Lewis' Electric green Cadillac, Neto's orange Porsche 911 Targa, and of course Indiana's local favorite, Jimmy "the splendid splinter" Rayl's beautiful 427 COBRA. Jimmy's Cobra would rattle the window's of Neto's lounge when he started the motor, similar to the way his three pointers rattled the nets in those close games against Kentucky and Utah at the old Fairgrounds Coliseum. Neto was a great player and true ABA legend. After all anyone who kept a lion as a pet and made all those All-Star games, must be mentioned as one of the all-time Pacers." MEMORIES OF JOHN BUDKE: "I can remember going to some games at the Fairgrounds Coliseum during the first few years of the league. Before the games you could often see Bob Netolicky with a beautiful woman on his arm. It was never the same one and one night he had two as he walked around courtside before the game. "